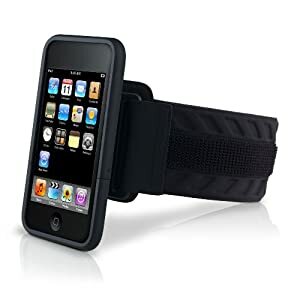 Suitable Exercise Carry for Ipod Touch? I use a very nice HIIT timer app for timing workout intervals with my IpodT. Most times I use kettlebells swings and snatches at home, but I did something to my back muscles between my shoulder blades and it is murder just to pick up the weight. So today I ran intevals on a steep hill just up from my apartment, about 30" up; and I take about twice that to go back down. I stuck the Ipod in my jeans, but it kept getting turned off by my thigh. Can anyone rec a good arm pouch or other secure carry that will still allow me to use my earphones? I stuck the Ipod in my jeans, but it kept getting turned off by my thigh. Can't you just turn the lock switch so it doesn't accept input? For cheap chinese knockoff accessories, I use dealextreme.com - you can usually grab cases, chargers, etc for a few bucks and free shipping. If you want higher quality you can go to an apple story, best buy, etc and buy a brand name one. when in doubt...check Amazon.com, or Best Buy. Mine is really really good. I'll give you the bend next time I'm at my big computer. At some point I'm going to buy a swing-arm lamp, remove the lamp part, and attach the iPod to it so I can read lying on my back without holding my arm up (I know, sounds lazy). T-Al's arm band looks fine, and it's always helpful to hear from someone who's actually used it and likes it. Another more general purpose option is a SpiBelt: Spibelt | Running Belts | Fitness & Travel Belt | Passport & Phone Holders | Waist-Hip-Pouch-Money-Insulin . The pocket looks small but it's stretchy and I can fit my droid phone in it easily with room for something else small, certainly a key or small set of keys. It does not bounce or move at all. I wear it running, and don't even feel it during a marathon. It would also do well as a money belt to wear under a shirt. I've seen other brands at marathon expos with two pockets but I can't remember the names. Thanks guys. I just got home and I am kind of sleepy, but tomorrow I will look these up. I use a vented nylon shirt with two breast pockets. My Iphone fits in easily, and once I start listening to an audio book, I can hit the button on the top of the unit to turn it off while the book keeps playing. This would be uncomfortable for people in a normal (warm) climate, but here in the Pacific Northwet, it is mostly cool and wet. I use the Otterbox Universal Defender case for my iPhone. It comes with a tough, bulky, hard white plastic clip attachment that you can put on the outside of the case when a clip is desired. At the gym, all I have to do is slide that piece onto the case, and clip it onto the waistband of my gym shorts. Quick and easy, and when I clip it onto the side of my shorts (instead of the front) it doesn't get in the way. The earphone attachment to the iPhone is easily accessible as is the face of the iPhone, if desired. No need to fiddle around with armbands or to remove it from the case, this way, and I like that. I just slide it into the clip thingie and go. I used an armband previously but it is gathering dust. Not sure if Otterbox for the iPod Touch has a similar clip thingie or not. But Al's solution has a clip so maybe that is the best solution for you. A lot depends on whether you want to be able to access all the features of the device without opening or closing something. For example, I can just tap on the "next" button to go to the next song, and I can look and see what's playing, all while running. And I've used it in the rain also. I ordered this one, in lime green. I don't need immediate access to IPod controls, and this reminds me of the very secure carry that I had with my old carry belt for Walk-Man.